Over the weekend I received early access to the all new eBay Seller Hub on 2 of my eBay accounts. 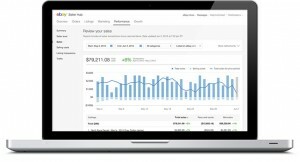 If you know anything about me, I am a numbers guy, and eBay Seller Hub is the new analytics and business marketing interface from eBay. It took over 2 weeks for it to work and analyze all my sales and marketing campaign within eBay (on the back end), however, late Friday night I was able to see the results. I used to use a few 3rd party services and go to multiple pages within eBay, not any more. The new free interface aggregate all my sales, traffic, marketing, and it even deducts the fees automatically to show my net sales, not only that, I got super useful insights and eBay even gave me some recommendations that (from my own experience) I know it’s actually good recommendations. If you do not have it yet, you can request early access right here. It even breaks down my view by sales trends and country, I am really impressed so far, not only that, they will keep enhancing it though 2016 as well. Enjoy the new Seller Hub. P.S. Tomorrow we will be announcing something we haven’t done in almost 8 years, it’s eBay related, and it’s AWESOME! Stay tuned.